Back in 2006 I started sending my music listening activity to a web service called AudioScrobbler, now known as Last.fm. Over eight years or so it has been silently and dutifully recording all the songs I listen to on my computer and building a database of my musical tastes. I think it’s pretty representative of my full listening history, despite it not including things listened to in the car or elsewhere. It’s compiled a pretty amazing list which today reached the major milestone of 100,000 songs by scrobbling “Gone” by The Head and the Heart. 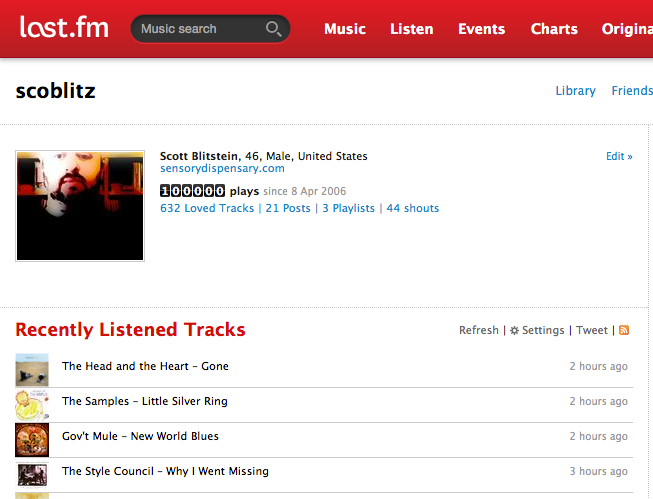 Last.fm is probably still my favorite web service. While the radio features and other functionality have varied, the collection of my listening data adds a whole new dimension to my love of music. I can see who and what I listen to most frequently, when I first or last listened to a song, and with the API and add ons I can view all sorts of data and visualizations like this one which breaks down my listening habits and the diversity of my library. Here’s a link to my profile if you’re interested in taking a deeper look at the data.